Apart from OST to EML, the software migrate OST files in more than seven file formats. Click on scan and select ost file. Browse file from local system and click on add. Then after, it allows to preview files in 8+ advance modes. OST to EML Converter software provides functionality to perform search based on queries. Choose desired mail to export. 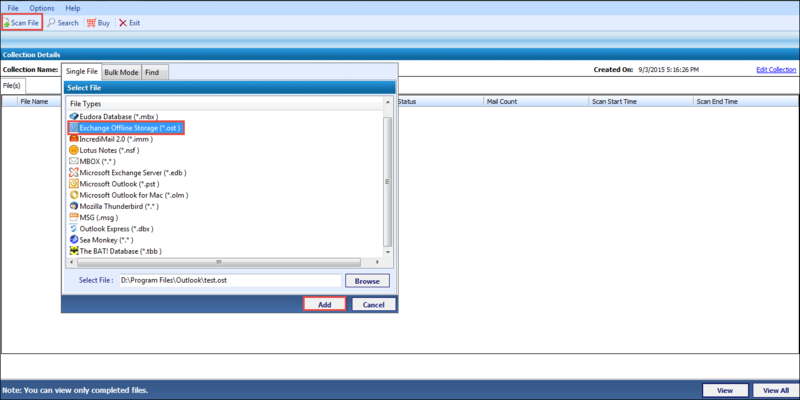 For bulk conversion user can use export option given in to bar. Select EML as output file format. Apply option such as maintains folder hierarchy, multiple naming convention etc., to optimize results. Then finally click on OK to execute the process. Being the Business Analyst of Multinational Company, I have to visit regional offices of the company located in different countries. While traveling to the different office I have facing problem in accessing the emails and other important notes and task. These are very important to me as well as the company. I am unable to do any productive work without my email. So I decided to convert it to such email format which is easily accessible in any email client irrespective of Mail server and location. Can I convert orphan OST file also using the software? Is the software capable of recovering corrupt OST file? Is Exchange Server needed during conversion process? Is it possible to convert bulk OST emails to EML? Will software convert attachments of OST emails to EML files? You can convert any numbers of emails using the Converter tool Also, you can convert multiple OST file to EML using the tool in bulk. Can I view the attachments along with emails? Yes.software also converts the attachment and users can access these attachments through EML files. Can I run this tool on my Windows 10.1 system? Yes. tool supports all Windows versions, and it can be easily utilized in Windows 8.1 version. Does this OST to EML Conversion Tool support orphaned OST files? Yes. Tool is capable to support orphan and inaccessible OST files and converts them to EML files without any complications. As some of our Outlook OST files were completely inaccessible, we wanted to perform conversion of multiple OST files to EML. Thankfully, we found this tool and we could easily perform complete conversion in hassle-free manner. Thanks a lot! I was worried to use a commercial online application but one of my colleagues suggested me this tool for OST to EML conversion. I am completely satisfied with its functionality and output and gratified with the response from Technical Support team. Thanks!